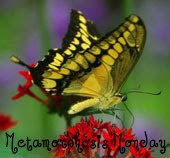 Thanks to Susan @ Between Naps on the Porch for again hosting this wonderful Metamorphosis Monday. Be sure to check out her blog to see what she's been up to and to find a list of all the other participants. You're sure to find some wonderful inspiration and creative ideas. In my last post I set the date for the next "Cloche Party". Since most of you wanted to have one seasonally, I thought Sept. 11th would be a great date to introduce the Fall season and our fall decorations. I have been trying to make the rounds to let everyone know, but I was disappointed to see that Mr. Linky doesn't still display all the participants in the last party, so I really need to rely on all of you again to spread the word. A big huge thank you to everyone for posting the button on your sidebar. Anyway, I thought maybe I would try to change one of my cloches to give an idea of how versatile they are. While it is not decorated for fall, it is fun to play with. Show us some of yours before fall too. 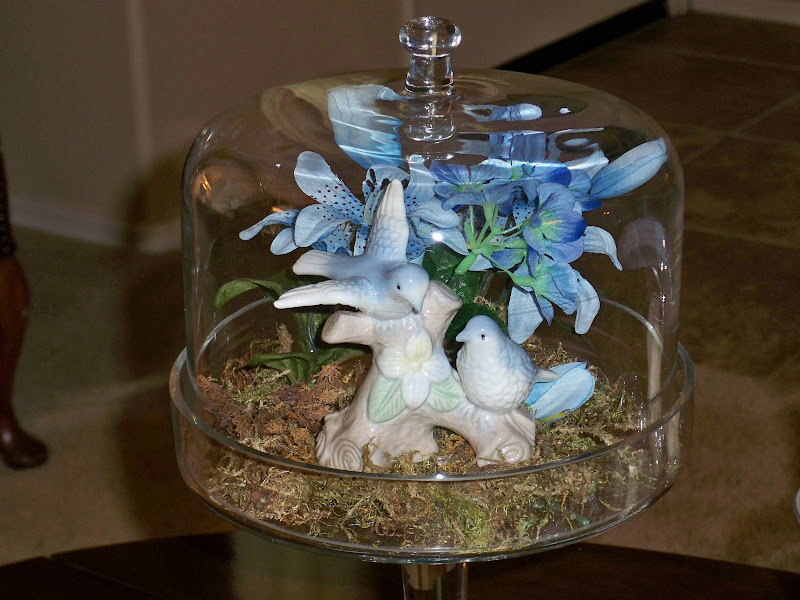 Below are two pictures that I showed in the last "Cloche Party" using one of my cloches. 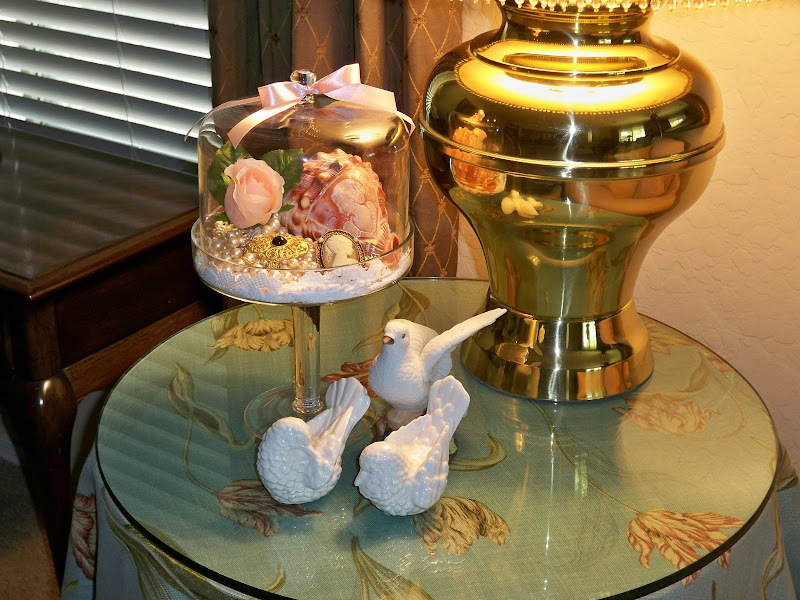 Just a simple vignette with flowers and a small bird figurine. 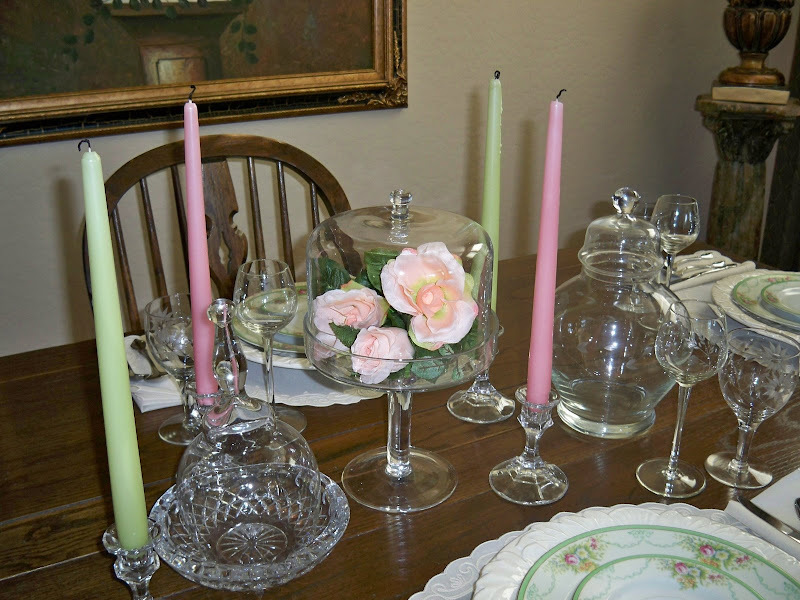 This is the same cloche I used for a tablescape simply filled with roses. I decided to change it up and use a few of my favorite vintage things. Pearls, cameos, vintage jewelry, lace and a rose. The cameo shell is one that we brought back from a trip to the Bahamas. The two pins were my mothers. The pearls are costume jewelry that I love to wear, and a single rose and small lace doily finishes the arrangement. Just some vintage memories displayed on an end table, but it makes me smile to see it. Thanks so much for stopping by. I will try to work on some ideas for fall. Dust off all your cloches and apothecary jars and start to think about your fall creative ideas. The stores are already full of fall decorations, so now is the time to find whatever you need. It also makes me think cooler too. lol It is so hot right now, but eventually fall will be here and cooler temperatures. See you at the party. Be sure to post the Cloche Party button on your sidebar to remind you and to let all your friends know. Thanks, I appreciate it. Oh goody. I love that stuff under glass or whatever. Love it, and I'm ready for another party. I think this is one of the best blog party ideas out there. Hi Marty, Today while I was shopping I saw a lot of Autumn flowers, wreaths, scarecrows, acorns etc. I am excited about your next cloche party. These that you featured today are all so beautiful. Hope you have a great week. This is gorgeous, Marty!! I love the cameos! Hi Marty! OH, how pretty! I have one of these little glass domed jars but I think mine is smaller. You really know how to set up beautifulness. I'll be there for the party and I've taken your Cloche Party button and put it on my blog! Hi Marty. I love your cloche. I especially like the one with the cameo. Very pretty! I have a question. Where are you all finding these pretty cloches? I haven't been able to find any. Thanks. You do such beautiful cloches. I love seeing all your pretties. I don't think I have ever seen a cameo carved into a shell, so pretty, no wonder you bought it. Thank you for your sweet comments on my deck. I have to figure out what I am going to do about the furniture. I love your cloches and the beautiful things you have on display beneath them! Beautiful pictures...you are so talented! I couldn't begin to make those wonderful arrangements. I just bought a cloche a couple of months ago. I used it in a tablescape in a recent post for the first time. I am excited about the new one in September. I am thinking of ideas now so I will be prepared. Thanks for sharing all of your creative ideas. So pretty - all of them -- I do love that cameo shell. Can't wait to see what you display under glass next! I also have still not found a cloche??? I'm still searching my friend....:) I'll be there. I always love the beauty of a cameo - great job on the new cloche arrangement! I just love coming to your blog and seeing your beautiful header. What a talent that arist was given. I am crazy about cameos, so of course I love the cloche with the cameos, pearls, and your mom's pins. It's just lovely. Thanks for stopping by to let me know about the next Cloche Party. Fall is actually the time of year that I go crazy with my Cloches. Can't wait! I must say I have one just like yours. I only put it out during Xmas time... not enough space in my little space!! P.S. The cameo's are my favorite. I so enjoyed visitng all the participants in you last cloche party, even though I wasn't prepared myself. This One... I will be ready!! How pretty! I love the soft colors! So lovely Marty. I am still clocheless, but on the lookout! I am still a cloche virgin too!!! I have been looking....may just have to make my own one of these days!!!!! your handi-work is just so beautiful....as usual! They all are pretty - especially the one with the vintage vingnette. Yeah for fall displays!!! I need to get started on it, Sept. will be here sooner then we think!!!! Marty, I am so excited you are doing another party...I didn't get to be there last time, But I will this time. The ones you showed are beautiful. you're just teasing us for the next cloche party aren't you! hee hee! very pretty and lovely ideas Marty! I will keep my eyes open for a cloche or a suitable substitute as I have nothing like that in my house. Fall is my favorite season. I hope to see you then. These are so beautiful, Marty! Marty, Love the cloches. I have the button on the blog page and will post the info on the cottages and bungalows forum..they have great love for cloches. Lovely ideas, Marty. 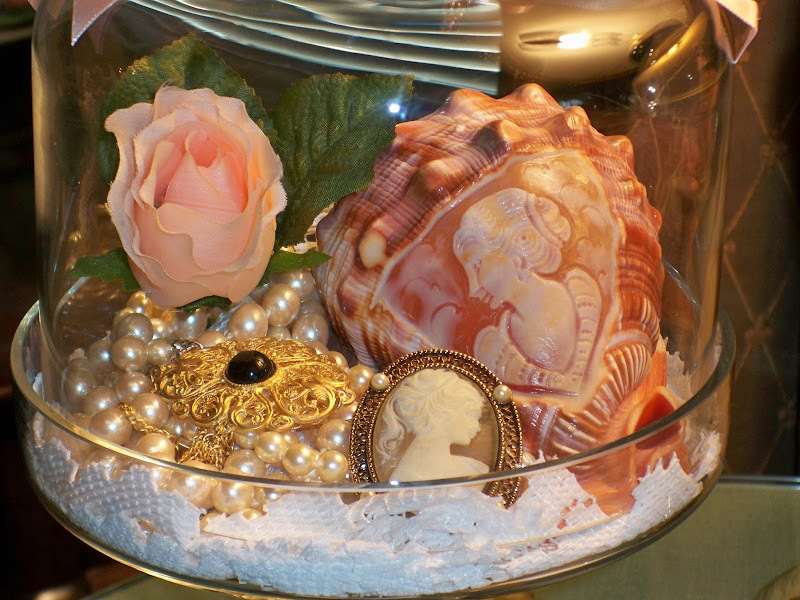 I especially love the shell and pearls....so pretty! Just simply love all the ways! I love cameos! I have to say I loved the flowers the most! Hi Marty... just coming back to comment on the comment you put on my blog... I just got a cloche! I actually sent that hurricane candle with the shells home with my niece when when left Friday... :( But I found a set of three sized cloches online and they arrived last week! I have been playing with them like a little kid! Ha! Can't wait for the cloche party! Your vintage cloche is adorable! I've got your button on my sidebar and I am ready to par-tay! Looking forward to it! I love the one with the jewelry! Marty, Glad you liked seeing all the goodies at the Open House for Collected Treasures! Her store is amazing & she does have a website & sells on EBay (power seller) if you check her Blog out you can get her website & check out the goodies. Your Cloche Party looks fun! I may have to come play too. I have an adorable tiny one that could be interesting as well as challenging to get things to scale. Have a great week. Very pretty! I like the one with the cameo! Oh, I just got a great idea! I'm looking forward to another cloche party! Cake plates not just for cakes anymore! However I would LOVE to have a FAB white cake with white frosting sitting on my cake plate right now! I think I need to find a cloche for myself and try to do up some pretties!! Oh my word girl...I love that idea!!!! I have to take a note! I can't wait til the next cloche party...this is just beautiful Marty!!!! Hope you are having a great week! 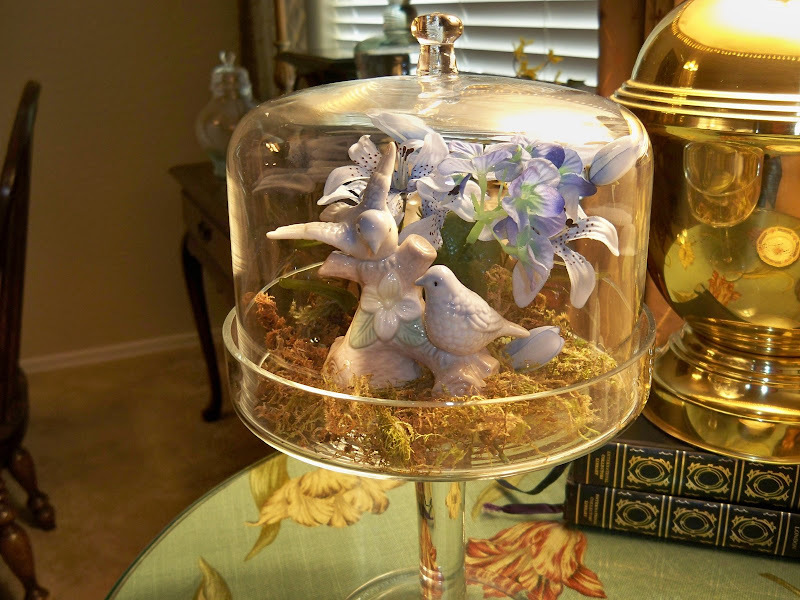 All the floral decorated cloches are so pretty, of course my favorite is the one with cameos! I posted your cloche button on my blog. I'm looking forward to it! Thank you for sharing these beautiful examples of your creations! You assemble and arrange then so artfully, and I learned a lot from this post. Thank you so much for the nice comment! I always love hearing from you ... and I love reading your comments on other blogs. You're such a warm, kind, affirming person. Just look how different you can make one decorating item look! What a great idea to place vintage jewelry inside. Love what you do and show us! I love the cloche with the jewelry! You've given me an idea for my vanity!!! Thank you! I'm very excited to join in your next party! Can't wait!!! Can't wait to see what we all dream up for September's party. Good preview of the cloche party - Yeah ! I will need to add your pic to my sidebar.....it is on my list ! Oh I am so glad that you are having a cloche party again. I missed the last one. Beautiful job as usual. I love the way you put everything together under your cloche. Hope mine turn out half as nice next party. Thanks for the wonderful comments on my kitchen. My house is always changing and a work in progress. so beautiful! I love cloches - I'm so sorry I missed this one! I have several myself. what a cute idea for a party. 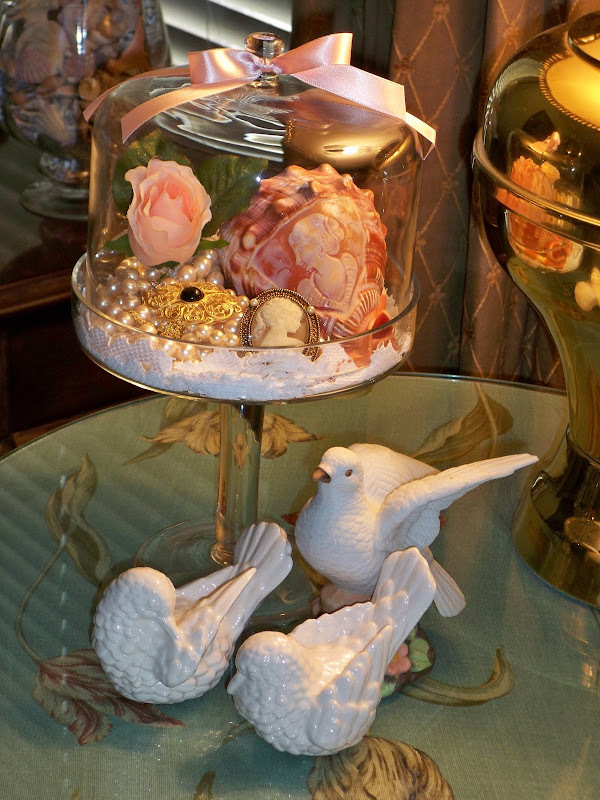 I love, love, love your cloche filled with cameos and roses! I am looking forward to seeing what neat ideas everyone comes up with for the autumn cloche party! Oh, Marty, I love this! An assemblage of loved things! I found something else similar to what you have your vignette in today at the antique mall! Grabbed it for the party! Hey Marty! I just wanted to stop by and thank you from the bottom of my heart for always stopping by my blog and leaving your sweet comment! I'm such a lazy blogger lately...no time to leave comments on other blogger's blogs (that's a mouthful) but I wanted you especially to know how much it means to me that you take the time EVERY TIME to stop by. Maybe I'll get better. BTW, your cloche setting is to die for! Oh Marty, how PRETTY. You have such a good eye for detail, and for putting just the right items together -- color, form, texture, shape -- it all works so beautifully. BTW I love the fabric of that tablecloth under the glass in the last picture -- gorgeous parrot tulips. It's so good to have my computer back! Your cloche looks very pretty in all settings, xv. Hey Marty - wow I love, love, love that second one!! Those colors and cameo are simply beautiful!! I'm going to keep my eyes open for some ideas of my own so I can play next time and I'm grabbing your button and will proudly display it on my blog to help remind me and everyone else! !